A dear friend of mine, a particularly handsome gentleman barely in his 60s, confessed to me recently that he was quite vain. I didn’t argue with him, but I thought about it afterwards. I don’t see him as vain, just as someone who pays attention to his appearance. Perhaps a little fastidious, but he’s former Air Force and since I spent some time in public with him, I appreciate the effort! I didn’t catch him flirting with his reflection in windows, so I figure he’s really pretty normal — maybe just a little extra special. At the same time, I assured myself that I had very little vanity about me. Beyond being clean and dressed in clean attractive clothing with hair combed, perhaps a little blush and mascara; I didn’t spend much time thinking about how I looked. And then came this past Saturday night. I fell. It was just two steps, but it might has well have been six. 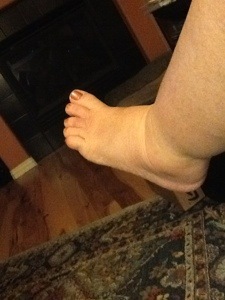 I’m bruised and sore with a swollen and discolored left foot and a right knee that looks a lot like it. My right shoulder aches, my ribs are tender, and my pride is wounded. I’ve re-activated my walking cane. I came to the realization, as I elevated my injured lower limbs, that it happened because I am vain. Instead of recognizing that the restaurant was poorly lighted, and that I was walking in unfamiliar territory, and instead of accommodating those realities by walking slowly and carefully and looking down to see where I was walking; I walked head erect and shoulders back and did a full horizontal dive in front of roomful of people. I’m lucky I didn’t break anything. At least I’m pretty sure I didn’t. I assumed since I was able to get back up on my feet and walk (albeit with a limp) that no serious damage was done (however, at my son’s urging, I’m going to try to get in to see my doctor and get checked out in the next day or two). It has, however, caused me to re-evaluate my vanity quotient. As I limped through airports today and elevated my black and blue elephant foot whenever I had a chance to sit, I was aching in deeper places than my muscles and joints. I can almost deal with no longer being the slender little cutie — almost — most of the people my age are in varying stages of decomposition, so I didn’t feel too badly about the shape I was in — until the shape I was in was so bad. Hope you feel better, Sharon. In regards to vanity I am in the midst of letting my real hair color grow out. I haven’t seen it in so long, I’m kind of excited about it. I look forward to seeing some pictures! I love my white hair. I earned every strand! You will never know how much you inspire me. I look forward every day to see what you have to say, whether it is a political commentary, your latest adventure (or misadventure) or what culinary treat you are whipping up. Feel better soon and keep up the good work. And I want YOU to know how much your encouragement means to me! Thank you, Arlette! Glad to see you blogging again! You have a way with a story! Thanks again! Knowing your background, I appreciate your encouragement. I’m still fighting the battle between writer and editor. I spent too much time editing and rewriting (or grading) and sometimes it really gets in the way of a story!